All materials are 6061-T6 extrusions with 37,000 PSI minimum tensile strength. The floor is constructed of aluminum alloy plank extrusions that provide rigid reinforcement every 5", and have a tongue-in-groove joint on top to take heavy punishment in stride. The standard long sills are 4" high x 2 1/4" wide structural aluminum channel, with optional 6" height available for hoist, or extra heavy duty applications. Rub rails are a custom shape providing 5 1/2" side height with extruded ribs for added strength and improved appearance. The rub rails, as well as the front and back rails, have stake pockets cut into the top. Bed corners are mitered for safety and improved appearance. Body comes complete with flush mounting 2 1/2" grommet style clearance, marker, and I.D. FMVSS lights with wiring harness. RATING: TC 500 is rated for 200 lbs/SF evenly distributed load. E.G. 96"W X 110"L= 73SF = 14,600lbs. Floor Construction - Plank extrusions provide rigid reinforcement every 5". Rub Rail - 5 1/2" custom shaped rub rail with mitered corners & stake pockets cut in the top. Cab Guard - Profile shape with protected window area. 5 1/2" frame matches rub rail appearance. Bulkhead of 1/8" bright diamond plate. Tailboard - 10" high, bright diamond plate with wrap around corners. 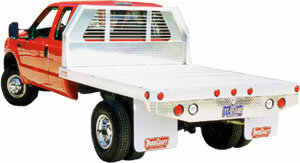 Includes license plate light, 4 1/2" stop, tail, turn and backup lights.